Description: A.B. Simpson, a master expositor of the Word of God and one of the best-known preachers of his day, devoted a lifetime to lifting up Jesus Christ. Perhaps in none of his writings did he succeed in that objective quite so well as in Christ in the Tabernacle. A.B. 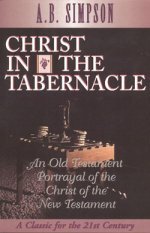 Simpson vividly illustrates how the Tabernacle was designed to represent and prefigure the most important teachings of the Scriptures concerning Christ, the Church and the individual Christian. About the Author: Albert Benjamin Simpson (1843-1919) author, hymn writer, conference speaker, was an evangelist to the urban masses of New York City and missionary statesman. Among his enduring achievements was the founding of The Christian and Missionary Alliance and what is now Nyack College.